Although Infiniti made it clear that the heart-throbbing Q60 Concept Coupe is a design precursor, it was clear when looking at the car that it's ready to go to production. We attended the Infiniti pre-show event for the North American International Auto Show knowing full well what it was they were going to show us. That didn't make it a breath-taker when its cover came off on-stage, however, as the lines of this lovely coupe are beautiful. The unveiling was attended by a small, invitation-only group of journalists and in between hors oeuvres and introductions to Infiniti's new head man, we learned a little about this car's future. The unveil the next day was largely the same, but was headlined by Roland Keueger, Infiniti's new president, as his first-ever auto show presentation for the company. You can see video of that below. The advantage of preview events is that they're smaller and give more access for both photography and face-to-face time with executives and engineers. In the case of Infiniti, it meant we had a more in-depth question and answer session for the Q60 Concept that gave us insight into the car's direction and future. 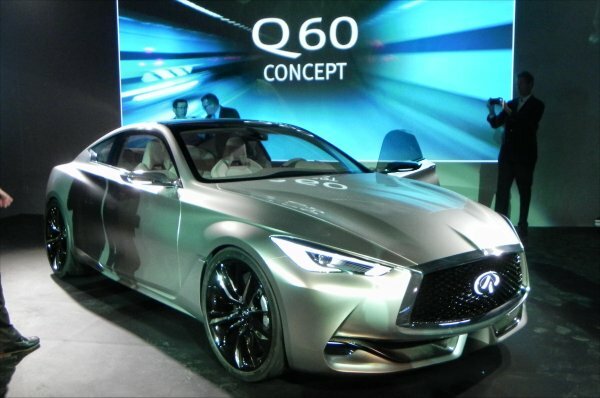 First off, it was made very clear that the Q60 Concept is a conceptual precursor, not a final production concept. Alongside that, however, was the note that Infiniti plans to move forward aggressively towards a Q60 redesign, aiming for a 2016 model year release - which means a final production model late this year. Knowing that, we can assume that much of the Q60 Concept will remain intact. From the presentation, this was solidified as engine and powertrain questions were asked and only vaguely answered. The exterior design of the coupe appears to be largely final as we're seeing it in this concept. Those beautiful curves, that well-mannered coupe fastback, and lovely grille and well cuts are all good things that should stay, in our opinion. The Q60 becomes a lovely entry between the striking Q30 and the drool-worthy Q80. The changes are more likely to be under the bonnet. A next-generation 3.0-liter V6 was promised, which was wholly expected. What intrigued, however, was the hint that the 3.7 was not gone and forgotten and could be seen as a turbocharged option. This may or may not have implications for the Q60, but it would have implications elsewhere in the Nissan/Infiniti lineup as a whole. Further, talk of a 4.0-liter engine with some turbos added was also rumored during the unveil, but no one at Infiniti would remark any further than "we will see what comes along." A turbocharged 4.0L V6 could have output of over 400 horses quite easily, which would be a serious kick in the pants in a car like the Q60 or even the larger Q80. With Infiniti's marketing pushing towards performance as a keystone, it's hard to imagine that the idea of a turbo 4-liter is being downplayed internally. Whatever it's final configuration, the new Infiniti Q60 Concept is beautiful and definitely deserves to be built.